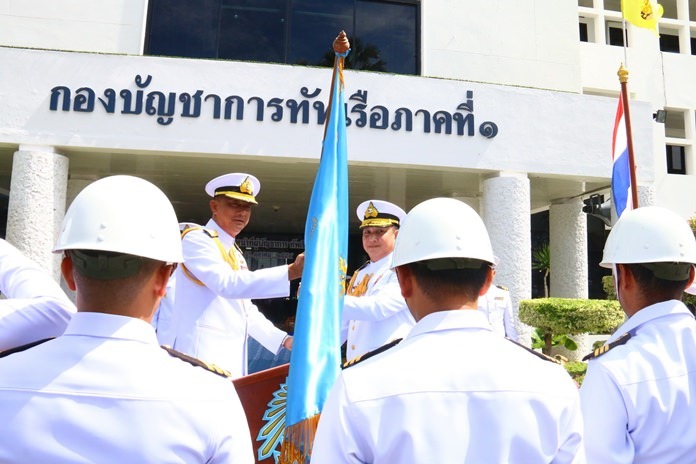 The naval force watching over much of the Gulf of Thailand has a new commander following the promotion of Vice Adm. Surasak Metayapa. Royal Thai Navy Region 1 Adm. Rangsalit Sattayakul presented the flag and mission statement for the Gulf Monitoring and Battle Squadron to Vice Adm. Surasak Metayapa at the Region 1 Operations Headquarters. Royal Thai Navy Region 1 Adm. Rangsalit Sattayakul presented the flag and mission statement for the Gulf Monitoring and Battle Squadron to the former rear admiral Oct. 4 at the Region 1 Operations Headquarters. Rangsalit said Surasak is experienced in operations, has great coordination skills and is known to execute missions with ease. He is also a great leader for fleets at sea, soldiers on land and in the air. Surasak will now be responsible for monitoring the Gulf of Thailand from Chumphon to Trat.